Hospice of the Red River Valley invites health care professionals to its September Lunch and Learn on Tuesday, Nov. 17, 2015, from noon-1 p.m. In this session, participants will learn a physician’s role in advance care planning. Attendees will also learn how to help their patients plan for a good life right up until the end. *The Detroit Lakes, Grand Forks, Lisbon and Valley City office locations will be connected via videoconference to the Fargo office where the live presentation will take place. This event is free and open to all health care professionals, but pre-registration is required because space is limited. Participants may bring their own lunches; coffee and water will be provided. 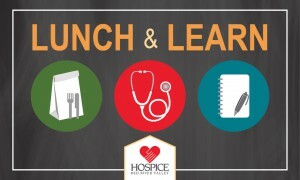 RSVP to Missy Haut: melissa.haut@hrrv.org or (701) 356-1563 one week prior to the Lunch and Learn, and indicate which location you will be attending.